Composed by Rupert Gregson-Williams. Arranged by Victor Lopez. Full Orchestra; Performance Music Ensemble; Single Titles; SmartMusic. Pop Concert Full Orchestra. Form: Medley. Light Concert; Movie; Pop. Part(s); Score. 206 pages. Duration 4:00. Alfred Music #00-46700. Published by Alfred Music (AP.46700). 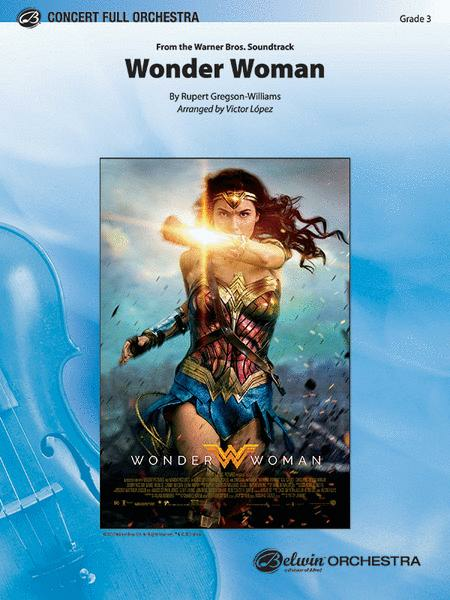 From beginning to end, this music from throughout the hit movie, Wonder Woman, is passionate and driven by strong emotions. Catch the explosive and engaging film action in this intense, yet flowing arrangement by Victor Lopez that captures the melodic contours, explosive dynamics, and time signature changes found in this fabulous music. This piece frequently changes tempo and often requires cueing, making it perfect for working on watching the conductor! This title is available in SmartMusic.